Our fresh market doesn’t just offer prepared foods and fill your stomach with delicious dishes, you can also purchase fresh food for a great price at Joseph’s. However, if you’re new to the cooking game, then you probably want some tips and tricks that will get your cooking to the next level. If you’ve been cooking for some time, then you can always get some refresher tips to ensure your dishes are as tasty as possible. Cooking is a process of trial and error and even though you haven’t gone to culinary school, that doesn’t mean you can’t make dishes that are delectable. You don’t need expensive cooking equipment, fancy fresh food, or to know everything about what tastes go well together. All you need is a bit of knowledge to help you pair your foods to enhance their tastes. Joseph’s Classic Market is a Top Rated Local® Gourmet Market that has top quality food. We have specials that give you the ability to purchase fresh food within your budget. You can also pick us for our catering services when you have a special gathering regardless if it’s a big or a small one. If you’re interested in shopping at Joseph’s Classic Market, then don’t hesitate to come visit us in either of our two locations. You can also order online! So you’d like to be a better cook. We don’t blame you when you have so much fresh food at your disposal. Cooking for some can be a nice way to relax after a long day. It can also be a way to show your creativity. There’s a certain fascination with cooking shows because so many people enjoy seeing what others can do with different ingredients. Cooking goes back thousands of years because it’s a way to feed our bodies. It doesn’t just have to be used to feed your body though. It’s a creative outlet that helps with de-stressing, organization, learning, and experimentation. To be a better cook, it’s important that you make a few mistakes so you know what does and doesn’t work. To help you become the cook you’ve always wanted to be, we compiled five easy to follow steps that will allow you to show off your culinary skills to your friends and family. The fresh food you use is the skeleton of the meal, but the spices are the blood of the dish. Spices make up the delicious tastes, they are the elements that make your dishes mouthwatering. Consider any dish you’ve made and note that there have been some spices that have been used to increase the flavor. If it’s only salt or pepper, that still adds some seasoning. Think about a chicken dish and how many spices you use to make it absolutely delicious, it’s a lot, right? When you use spices, make sure to toss them to the best of your abilities, especially when you are using ground cumin. When you use spices in your cooking, they can die very quickly. By tossing your spices together, you’re pulling more taste from the dish. To make sure you have the appropriate amount of spices, take a sniff. If you can’t smell anything, then you’re just cooking with dead, ground spices. In addition, make sure to store your spices in a dark, cool place to help them keep their flavor. Similarly to spices, herbs are also a way to give your dish the most seasoning possible. Herbs are different than spices because they are chosen from different parts of a plant. For example, herbs are from the leafy green portion of the plant and spices are from the root. When you use herbs in cooking make sure that you treat them like flowers. Essentially they are flowers because they come from the leafy part of a plant. As you know, if you cook with herbs, they can become limp very fast. By trimming the stems and placing them in water, you’ll be able to keep those herbs in tip-top shape and ensure they last longer. The best practice to follow when using herbs is to put them in water, place in a plastic bag, and store them in the fridge to keep them for longer. Just because a recipe calls for mayo or butter doesn’t mean you need to follow it to a tee. There are some ingredients that can be substituted for health reasons. If you want to make a healthier dish, then you may have to forgo the all purpose flour, the mayo, or the butter. If you’re cooking for people with dietary restrictions such as egg allergies or gluten-free intolerance, then you’ll have to get a little creative. Essentially, it’s a good idea to figure out what you can substitute some ingredients for because it makes your dishes healthier and can end up saving you money. Substituting Greek yogurt, for instance, will make your salad dressings healthier as well as your cakes. Using applesauce instead of eggs or oil can make your desserts much smoother and healthier. Stocking up on protein such as chicken and steak are great ways to save you money and time. When you see something on sale at Joseph’s Classic Market, you can stock up on some supplies even if you aren’t using it in this week’s dishes. By stocking up on your needs when there are specials, you’ll be able to save money, time, and have everything you need on hand when you need it. The freezer is such as great way to save chicken, beef, and even fish. Additionally, stocking up doesn’t just mean protein. When you make a huge batch of soup or you have some leftover cookie dough you don’t want to use, putting it in the freezer to keep for longer will give you a delicious meal or make baking cookies easier. Lastly, a great tip to condense the mess in your kitchen is to designate an area for garbage. You might be tempted to pull the garbage can toward where you’re cooking or leave the door open to under your sink where you keep the garbage, but for safety reasons, it’s a better idea to have a garbage bowl. A garbage bowl will keep your mess to a little area, eliminate any accidents from occurring, and it’ll make cleaning up easier. A garbage bowl or a bag is a great way to get rid of your plastic bags, vegetable shavings, and your egg shells. If you like to compost, then you can have two bags, one for garbage and the other for all the items you can put in your composting bin. 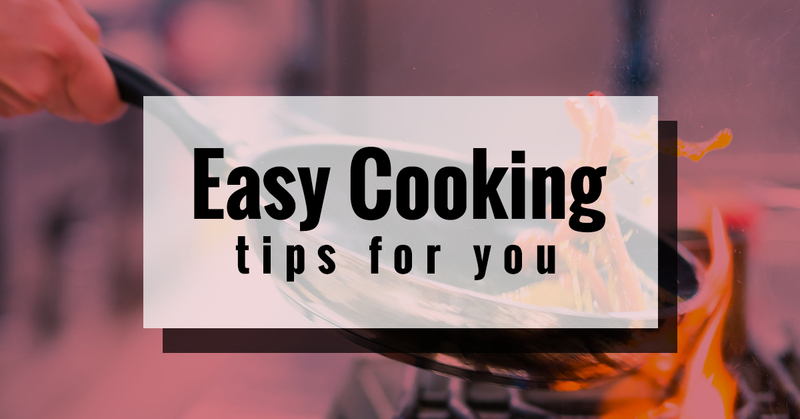 For more tips and tricks for cooking, stay tuned for our next blog!